Famous more for its high productivity than for producing wines of distinction, the Carignan is one of the most highly planted grapes that you have probably never heard of. Planted in huge amounts in the south of France, most of which is used for industrial purposes. The Carignan is heavy in acidity, tannins and color, which make it great for blending, but also high in bitterness, which makes it not so hot by itself. It grows well in hot climates, exhibiting flavors of pepper and plum in its inky depths. Carignane originated in Spain where it is known as Cariñena, but dominates the south of France, especially the Languedoc where it is known as Carignan. It is also widely planted in Italy (Carignano), as well as the United States, Mexico and South America. The name for Carignan used in the Rioja region of northern Spain. The third most planted varietal in Spain. Buds and ripens late, so is best suited for warm climates. Tannic and acidic the Mazuelo is most often used in Spain as a blending grape. Cousin of Cabernet Sauvignon, Cabernet Franc is a lighter, fresher version best known in the red wines of the Loire (Saumur in particular) and Bordeaux. Examples from northern Italy and eastern Europe are also worth looking out for. The grape is low in tannin and brings notes of raspberry and herbs to a wine with an almost 'crunchy' freshness. A perfect summer drink. The best known of the Cabernets, and the undisputed heavyweight champion of the Médoc. Small and tough-skinned, its grapes produce deeply-coloured wine, full of blackcurrant, mint and green pepper flavours. The tannins present enable some to age for decades. Cabernet Sauvignion is the Number One red grape variety of the world, it is best known in Bordeaux, but now has been transported to almost every wine-growing region in the world. It frequently appears as a single variety, but more often it partners Merlot, Cabernet Franc and Petit Verdot or, in Australia, Shiraz. The most widely planted grape in Spain (where it is known as Garnacha) and the second most planted variety in the world, Grenache produces soft, velvety, high alcohol wines with sweet, ripe blackberry flavour. This makes it good for blending, adding charm and softness to Rioja and weight and fruit to Châteauneuf-du-Pape. It appears all over the southern Rhône and southern France where it also makes luscious, rich, fortified wines (in Roussillon, Maury and Banyuls) and oceans of fruity rosé. Widely and sometimes loosely used name for a range of usually relatively ancient grape varieties, the most famous of which inspires the richest style of madeira. The word is derived from the Greek port Monemvasia, through which so many rich dessert wines passed en route for western and northern Europe in the Middle Ages. In modern Italy there are at least 10 distinctive forms of Malvasia, planted all over the country. Malvasia Toscana is commonly blended with much more Trebbiano in a wide range of Tuscan and Central Italian whites. Malvasia Puntinata is small-berried and superior. White Malvasia tends to be a deeply coloured, quite alcoholic wine which can oxidise easily but has an intensely nutty character, sometimes with notes of orange peel and dried fruits. Malvasia is also grown in Spain and, in Portugal, is the richest of the Madeira grapes, its name having been anglicised to Malmsey.A noble variety grown in Madeira, where it is also known as Malvasia Candida. It was the first of the noble varieties to be planted in Madeira back in the 16th century. It is high yielding, and a late ripening grape which performs best on well-drained soils and in well-sheltered low altitude sites. It is often blended with Tinta Negra Mole in the production of Malmsey which is the island's richest and sweetest wine. See The Cheese and Wine Shop Madeiras here! A grape very much in demand, thanks to Bordeaux's Pomerol and Saint-Emilion. In California, where it makes concentrated Bordeaux-style wines, it has almost cult status. Supple, soft, rich and velvety even when young and, when used in a blend, smoothes the way for more tannic varieties such as Cabernet Sauvignon. Quirky Pinot Noir can make some of the world's greatest wines, breathtaking in complexity. One of the trickiest and most unpredictable grape varieties to grow too, it performs best in the relatively cool climate of Burgundy. Producers all over the world have tried to emulate these superb examples, but few succeed. Some of the most successful attempts come from New Zealand, California, Tasmania, the Loire and north-east Italy. New Zealand Pinot Noirs are recognized as being truly class leading; try our Cloudy Bay Pinot Noir. Before the 1970`s, Syrah was little known outside the northern Rhône and Australia, where it was and still is that continent's most widely-planted red grape. Since then, thanks to a surge in popularity, it has been planted thoughout the southern Rhône and southern France and is viewed as an 'improver' among the oceans of lesser-thought-of varieties such as Cinsault and Carignan. A noble variety producing dark, complex, long-lived wines with powerful, rich berry fruit, particularly in the northern Rhône's Hermitage and Côte-Rôtie.Shiraz is a potential rival for the crown of ‘world‘s greatest black grape‘, Syrah has emerged relatively recently as one of the most-planted grape varieties worldwide. The two ‘classic‘ regions in which it thrives are the Northern Rhône valley, where it makes fabulous, dense, spicy wines which age majestically for decades, and Australia, to which it was introduced in 1832 by the settler James Busby and goes by the name Shiraz. The two different names usually denote two very different styles. Shiraz has come to be used for richer, blacker wines with more ripe fruit flavour on the mid-palate, while Syrah tends to be used for structure-driven wines with more restrained flavours of black pepper and spice with characteristic black fruit. The grape is thick-skinned and prefers warmer climates, although its flavours tend to degenerate jammily if subjected to too much heat. Excellent examples in the Syrah style can be found in the Languedoc-Roussillon, the Hawkes Bay area of New Zealand and now some cooler parts of Australia; in its Shiraz guise Australia is still the heartland, but is also cultivated in South Africa and California. Meaning 'early ripener', Tempranillo is a master of disguises at home in Spain - known as Tempranillo in Rioja, Navarra and Aragón, Tinto Fino in Ribera del Duero, Cencibel in the centre and Ull de Llebre throughout Catalonia. It is Spain's most noble variety, making stylish wines with strawberry and sour cherry flavours that combine perfectly with the flavours of oak in the Reserva and Gran Reserva wines. A small amount is also grown in Portugal and Argentina. The Tinta Negra Mole, is the ”workhorse” of Madeira grapes, and grow primarily in Funchal, Câmara de Lobos in the south and São Vicente in the north of Madeira, Portugal. This vine, accounting for roughly 60% of total grape production in Madeira, was developed from crosses of the Pinot Noir and Grenache varieties. As for the grapes, they are small, globose of elliptic-globose, soft, black with light pulp, very sweet and grow in small to medium sized, nearly always dense bunches. The Negra Mole produces an excellent wine and good table grapes. Buy Cheese and Wine Shop Madeiras here. The hallmark of the Viognier grape is the scent of spring blossom and jasmine and the rich flavours of apricot and peach. Ripening in warm sunshine, it can become quite heady and exotic with spicy undertones and plenty of body. Because of its spicines sand body, it can be confused in blind tastings with Alsace Pinot Gris. The Verdicchio grape variety from Italy that produces a wine of the same name. 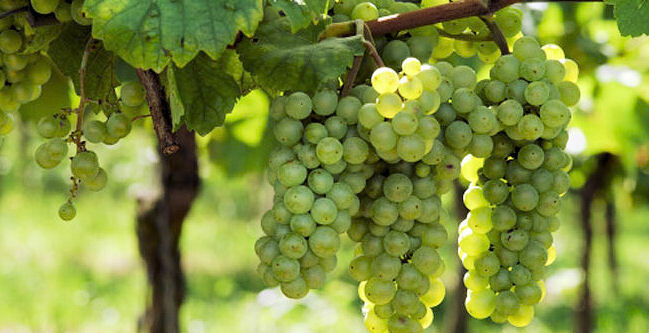 Verdicchio (the grape) is a rapid growing, high acid grape grown almost exclusively in Central Italy where it is thought that the grape developed. This grape has a yellowish green color. Verdicchio grows best in well drained soils of sand and limestone. Verdicchio, the wine, is slightly green-yellow in color and has a delicate bouquet. It is medium bodied with surprisingly strong flavors, a crisp acid balance and a slightly bitter finish. It is best consumed within the first two years from the vintage date. Most bottlings of Verdicchio allow up to 15 percent of other grapes to be blended in. Trebbiano and Malvasia are the two other grapes that are permitted.